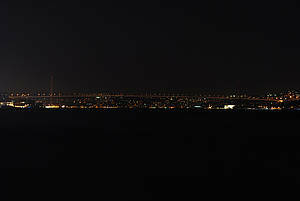 Lights going out on Istanbul’s Bosphorus Bridge was a fitting way to mark Earth Hour’s transition from Asia to Europe. The symbolic action of turning lights out for an hour in an expression of concern for the environment is in the process of being officially observed in thousands of communities across 134 countries and territories on all continents. In Turkey, one of only a few countries to straddle 2 continents, the lights had earlier been switched off in capital Ankara’s Opera House. 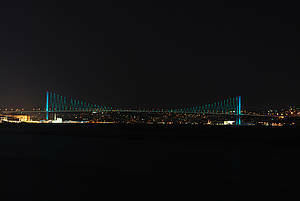 WWF-Turkey enlisted 250 businesses and corporations and 2,000 online supporters to support its Earth Hour efforts. 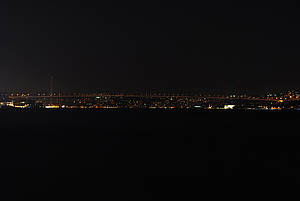 The CEO of WWF-Turkey Tolga Bastak, made his Earth Hour press speech while the lights of the Bosphorus Bridge were going dark. “This year, the lights are going off for a different cause,” Bastak said, “we put great pressure on the natural resources of our planet and our ecological footprint exceeds the biological capacity by 50 per cent. “If we continue living and consuming as usual, we would need two planets by 2030 and 2.8 planets by 2050. It is getting harder and more difficult each day to survive in our ‘global home’. We should try living in the resources that the planet supplies and respect the limits of one planet.